Here is another big box. This one has 6 narrow drawers and one large drawer. I discovered that by rearranging the order of the drawers, the design changes. 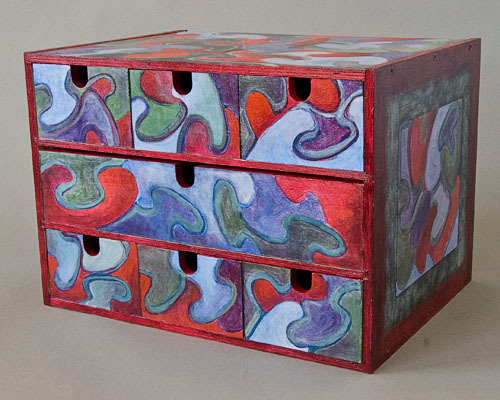 The big drawer can be on top, on the bottom or in the middle. The shapes in the little boxes join together differently when you switch their order. My paintings are realistic. The boxes are abstract. I've tried doing abstract paintings and find it frustrating. I'm thrilled that within the context of boxes, I can have fun playing with abstract art. I love painting these!